We run regular Children's Art and Craft Courses during the School Holidays. 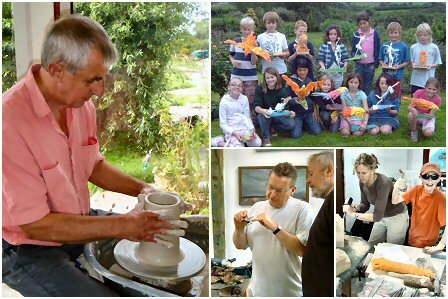 We also run occasional Adults Courses in Art, Pottery, Metal Sculpture, Paper Sculpture, Stone Carving , Textiles, Creative Writing, Illustration and Digital Photography. Take a look at the Arts Award Scheme as some future courses will be linked with this exciting development. All courses run from 10am to 3.30pm unless otherwise stated. Please bring a packed lunch and wear suitable footwear - No flip flops! Payment on arrival on morning of course by cash or cheque - sorry there is no card facility. Inclusive of all materials and equipment. This is an exciting opportunity to produce a significant piece of work for the garden or home. Participants can choose a piece of stone to carve. Skills and techniques will be taught including working safely in a workshop environment. Old clothes and stout footwear to be worn. A new venture 2 day course.